I thought I’d bring back a fun feature to the blog… sketches. I LOVE sketches. I’m very graphic and visual. 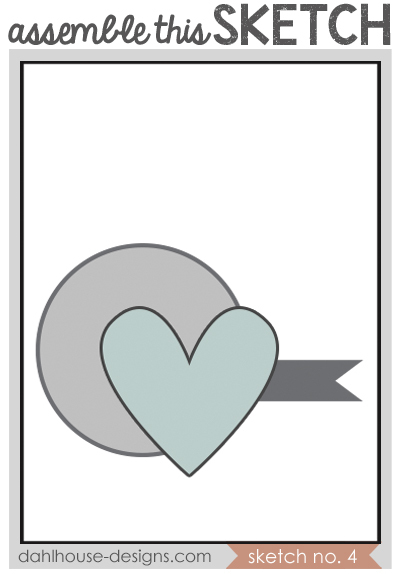 I love a blueprint and will generally sketch out a card idea before I head into the craft room. You’ll find hundreds of sketches in my house. This is usually how I start my process and then I’ll pick my stamps, papers, and colors. It is a great starting point for me. I’m using the sketch above to create two different but similar cards. 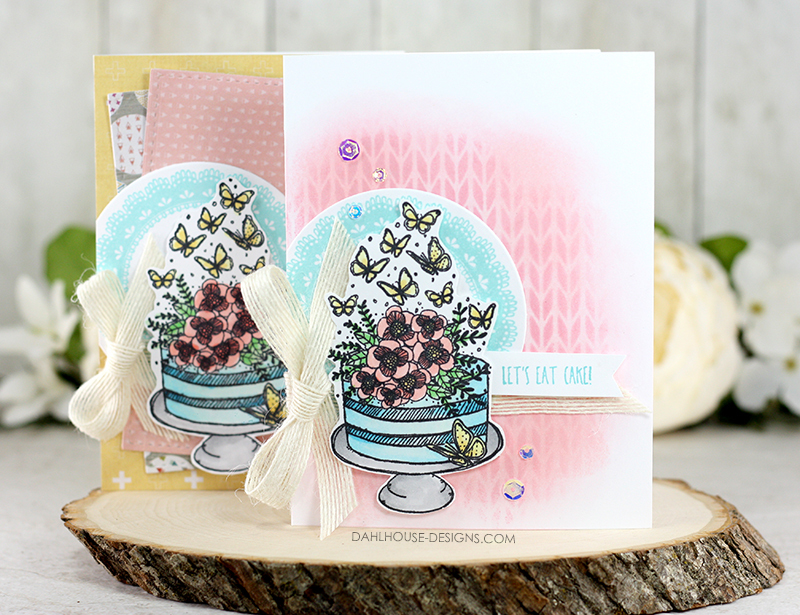 I’m also using all the same stamped images from some amazing Unity Stamp Company sentiment kits but changing up the background to create two very different cards. It’s a fun way to add cards to your stash but still keeping each one original. For these cards, I turned the circle into a doily, the heart into that stunning cake image and the banner contains the sentiment. To make them different, I varied the technique and supplies for the background. For the first one, I used a stencil to create a patterned background and layered some pretty patterned paper for the second one. 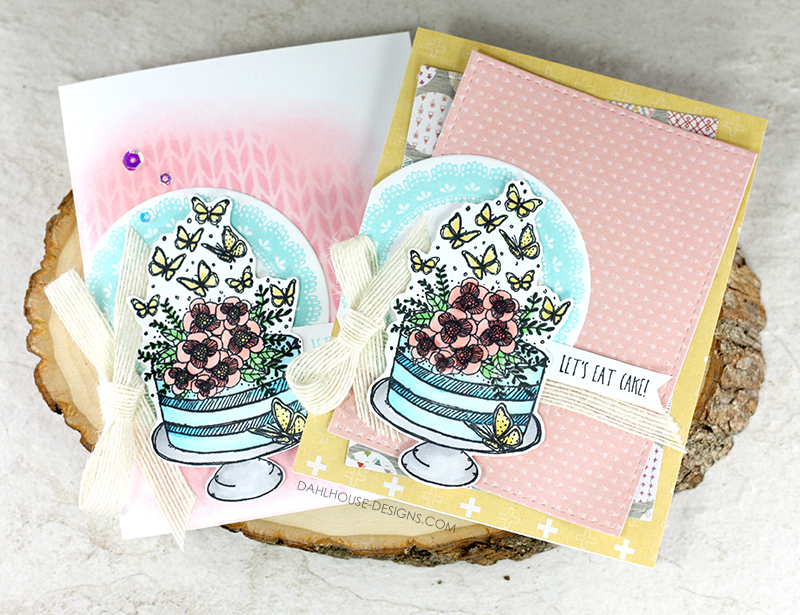 Two totally different looks but still using the same stamps and layout. I talk through my process in the video above if you want some more guidance on how I came to create these two cards. Let me know what you think of the Assemble This Sketch? Do you miss them, do you love them if they are new to you or are they just eh? I’m super curious to know if you want more. I think your Assemble This videos are great! Especially when the cards are as beautiful as this (which they usually are lol)! I love your cards and may try out the sketch. I love following sketches! I’ll share if I do. I love your “assemble this” projects Lisa…I hope you continue them. Your cards are absolutely beautiful my friend. I enjoy visiting your blog so much…always beautiful. I, for one, am thrilled to see your sketches back! Especially when you show two inspiring ways to use it.